Our time in the Algarve was coming to an end and we had seen some beautiful scenery and enjoyed superb hikes and walks. Even in December, the weather was warm and sunny, apart from a few days of rain and one storm. It has given us even more incentive to return to Portugal, knowing that there’s so much more to explore. We hadn’t realised that we had saved our best day trip until the end. 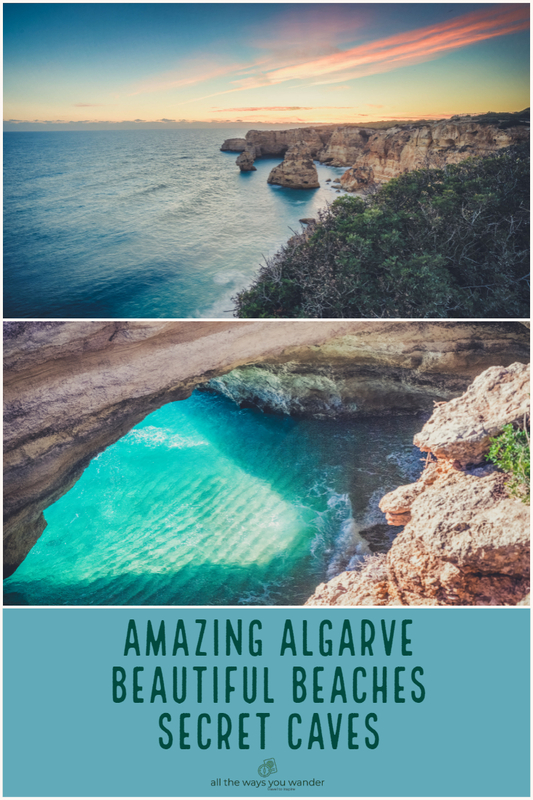 We headed out to see, what the Michelin Guide has named, one of the 100 best beaches in the world, Marinha Beach, and to wander part of the Seven Hanging Valleys Walk. If you’re anywhere in the Algarve, do try your best to get here as it is the quintessential picture of what the Algarve is famous for. It will be a highlight of your holiday. To make the most of your trip in the Algarve it's worth hiring a car. 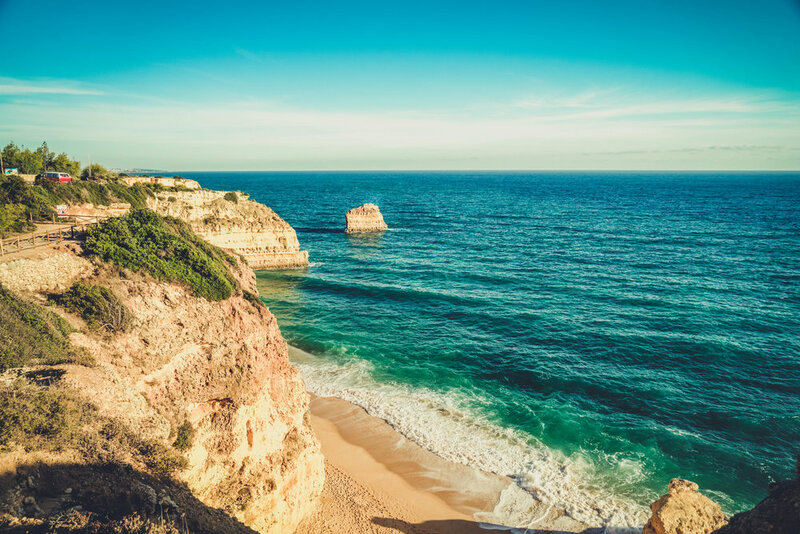 There is public transport to most of the beaches and you can find your best options for buses over on Algarve Bus but it seems Marinha Beach is best visited by private tour, taxi or rental car. To get there by car, you’ll find it easily from Albufeira and the fastest route follows the A22 west towards Lagoa. Similarly, from Lagos and Portimão, you can speed along the A22 heading east, exiting at Lagoa. We took the slower route along the N125 and then south onto the M1154. It’s a pleasant drive so slow down and take in the scenery. There are gorgeous villas out here that you can fantasize about owning! Follow the signs for Marinha beach and, after some twists and turns, you'll come to the car park which is on top of the cliff, right above the beach. It's a steep descent on a lot of steps to get down to the beach. If you can't be bothered facing those steps, don't worry, the car park has picnic benches and shade with spectacular views. During the winter, the car park will have a few campers in it and they have the enviable advantage of overnighting to get the best spot on the beach early, before everyone else arrives! We have a plan to do just that when we have our own van (soon hopefully, depending on our rapidly depleting budget!) The beach is tidal so you can either stick to the small beach right at the bottom of the steps or be prepared to get wet and try time your walk to the far side with the tide. There’s a lot more space there so it’s perfect if you want to spend the day on the beach. Sunset-coloured sea stacks and rock arches, hidden caves and crystal clear waters are what make this beach so beautiful. It truly deserves its place as one of the best beaches in the world! The cliffs are under constant erosion, so there are plenty of warnings about potential rock falls. Try not to sit under the cliffs and instead stay near the water, just in case! When we were there, the waves were huge and in some parts it looked like a washing machine! We were nervous getting in, and rightly so. The waves knocked the hell out of us so we made sure not to go out of our depth. There were only a couple of others in the water but they looked like they could handle themselves against the mighty Atlantic in December! Having said that, in the summer, it’s a very safe beach for swimming and perfect for snorkelling, so we’ll just have to go back to fully immerse ourselves! We had our lunch of fresh local oranges with some bread and cheese and let the crashing waves hypnotise us for a while. We’re not sunbathers so we were itching to get up to the cliffs to walk part of the Seven Hanging Valleys trail. We headed back towards the steps and had to time a sprint, in between waves, as the tide was coming back in. Not that we minded getting wet but the couple ahead of us weren't prepared and unfortunately for their clothes and gear, mistimed a wave. It's something to keep in mind if you do get to the far end of the beach. Out of breath and needing a sugar rush after those killer steps, we revived ourselves, courtesy of the little snack truck in the car park, before heading for the trail. The trail hugs the coast and covers 11km from Praia de Vale Centeanes all the way to Albandeira Beach. You don’t have to do all of it to discover how beautiful this particular stretch of coastline is. 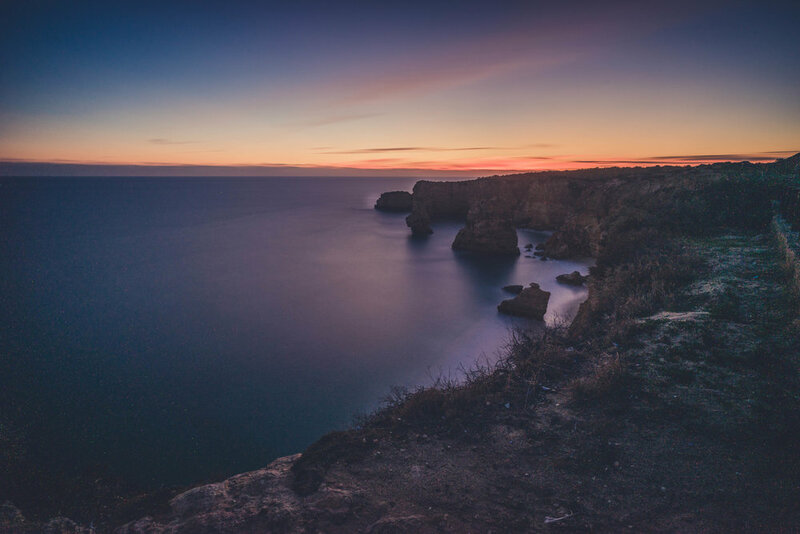 You can join it above Marinha Beach and walk to Benagil cave, which is what we did, and it truly is one of the best things to do in the Algarve. The scenery, the hidden coves and beaches and the colours of the cliffs are gorgeous and you’ll hardly notice the half hour or so it takes to walk. If you’re a photographer or even take the odd selfie you’ll have plenty of opportunities! Neil felt like his hero, Elia Locardi, taking some long exposures of the double-arched Arco Natural, an iconic postcard-picture of Portugal. Following the trail is very easy as it’s way-marked, like the other trails in Portugal, with little red and yellow stripes on wooden posts. You don’t exactly need your best pair of hiking boots but runners (sneakers) or decent walking shoes will do, as the ground is uneven and rocky. Take care on the walk and just be sensible by not going too near to the cliff edge as you wouldn’t know if you’re standing on an overhang. You’ve probably seen a picture of Benagil Cave but from a different perspective. It’s a unique secluded beach inside a cave that is only accessible by taking a boat trip, either from the nearby operators or even as far away as Portimão. We’ve read about people swimming to it from the nearby beach but we’re not sure if we’d recommend that option, unless you’re super confident in the water. The cave’s roof has collapsed which has created a sort of skylight above the beach and looks like a beautiful blue window from below. On the trail, there is no hint or indication you’ve reached it. We wandered over to what we thought was a sinkhole and lo and behold, at the bottom, was a pretty little beach. It was definitely a ‘wow’ moment, especially because we weren’t expecting it! It’s a long way down so be careful taking selfies. We spent a good bit of time here just staring down at the waves rolling onto the beach. All in all, we had a fantastic day out and the sunset was truly awesome. The colours are indescribable and we cannot wait to go back. 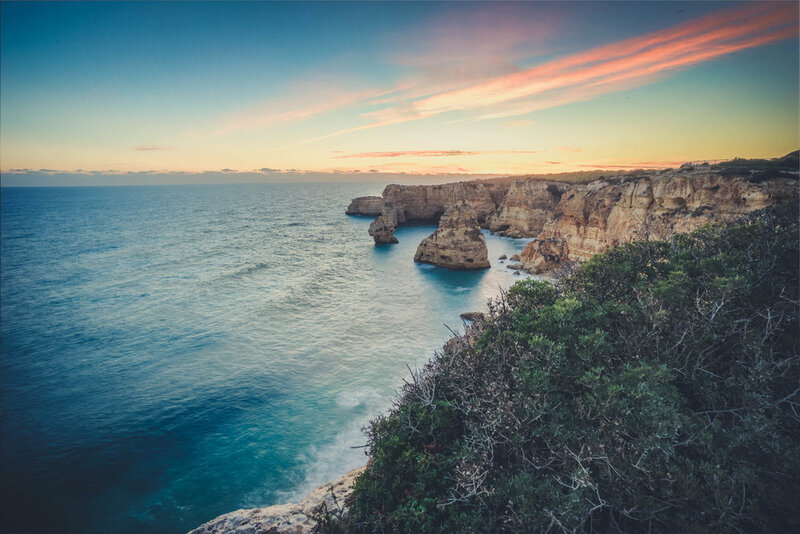 The Algarve has so much more to offer, we could spend another month there. Rest assured, when we do, we’ll be blogging about it, so stay tuned! If you’re going on the walk, bring plenty of water and sunscreen as there isn’t much shade and the beach doesn’t have umbrellas either. It's only during the summer months that there's a beach bar for snacks and facilities, so off-season, come prepared.